It is very clear nowadays that plants offer several opportunities for basic studies, e.g. on development and embryogenesis, and that the fundamental principles laid open contribute to the development of new tools for plant breeding. Within the scope of the present publication, the editors have had to make a difficult choice from the many important subjects that have contributed to the remar… kable progress of our molecular biological understanding of complex biological problems. This has resulted in review papers showing the present state of the art in genetic engineering, gene expression and its manipulation, microbe and insect interactions with plants, transposable elements and gene tagging, plant and organ development, the function and structure of the genome chloroplasts, and lipid biosynthesis. 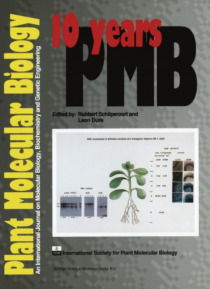 All papers have been written in such a way that they are also useful for non-experts interested in a particular field, as well as for students following courses in plant molecular biology. Besides presenting the state of the art, each paper gives some historical background to the developments in the field as well as perspectives for further basic research and applications. Because of the latter, scientists and students engaged in plant breeding will also profit from this publication.